Taking care of my elderly parents became a life changing experience. Anyone that has living parents might have to face this challenge someday. Usually you have to make this decision quickly after an emergency such as a heart attack or stroke and you do not have time to consider the amount of work involved or how it can affect your life. Many can’t afford assisted living, a home health nurse, caregiver or the copay for these services. Others want to stay at home or with their families. Due to the situation you might have to become the caregiver of your parent. It is an important subject and for many a ticking time bomb for personal disaster. I know because my parents wanted to remain at home during their illness. We could not afford an outside caregiver even with insurance and my folks were not comfortable with strangers in the house, so I became their caregiver but I paid a price for that care. Being their caregiver affected my relationship with some family members and friends. That decision also forced me to do procedures and tasks I thought I would never or could do. It also affected my work because my parents needed care 24 hours a day 7 days a week. My life is an example of what can happen even if you planned ahead. I had a plan to care for my parents but in life not everything goes as planned and I am now starting over putting my life back together. As the cover shows, an average person dealing with an enormous challenge. I am not a celebrity or famous, I am just a regular person that wants to make people aware of how much work is involved caring for an elderly parent. Unfortunately no one wants to hear from an unknown and self publishing was the only way to get my story out in public. Some might consider the book a hard read but it is written in my own words and I admit it is not polished or proper. Thousands of people care for their elderly parents everyday and most don’t want to talk about it because they are embarrassed or just too tired from all the work. I decided to write about my experience because people need to know of this challenge they might have to face. As a television anchor told me, “Your the best expert because you did it.” This book details real life, my life. Caring for elderly parents is so important that I have been interviewed on television in Southern California, Nevada and Utah to talk about this topic. I have also been interviewed for retirement newsletters and caregiving articles. I have created a YouTube Channel where I explain topics about caring for elderly parents to make people aware of this challenge. “You Got To Do What You Got To Do” is not intended to be a how-to manual because everyone’s situation is different and I am not a medical professional or expert. I am an average person that was given a challenge and learned how to deal with it. 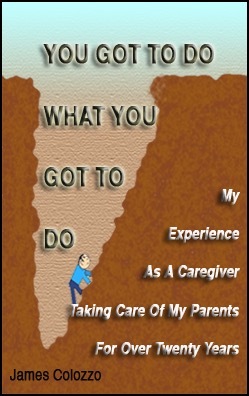 The book includes 70 chapters, over 400 sub-chapters describing my situation being a caregiver. It details what I experienced while I actually did all the work required to take care of my elderly parents for over twenty years.